Surely one can’t actually learn music without practicing it on the instrument in a practice room. Well, that is only partly true. Yes, you have to have your instrument and you have to practice with it to learn music, but there are so many things that can be done with only your sheet music and your mind. Below are some basic (and one advanced) tips that you can use to actually master new sheet music without setting foot in a practice room or playing a single note. The number one thing you must know about any piece you are learning is how it goes. You must be able to hum it, or at least hear it in your head. There are some people (nerds and Toscanini) who can hear music in their heads by simply looking at the score. The rest of us need to listen to it in order to learn the basics. Listening to a new piece is the fastest way to get to know it. 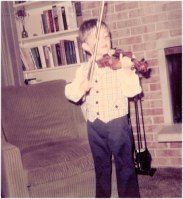 I grew up and studied violin through the Suzuki Method . Dr. Suzuki’s string method is terrific for young children but it there are many who are critical of it, especially when it comes to learning to read music. Students learning by this method learn at first by listening and then playing what they hear. Playing by ear is a valuable skill, but it can hurt later on when players ignore what is actually written on the page and just play what they remember hearing. I was lucky that I learned how to read music from the beginning. There are many Suzuki students who play in orchestras but don’t read and play their own parts. They just play along with what they hear. Not good. If you can master the skill of listening and playing by ear, by all means do it. Just be careful not to abandon the written page for it. There is no better way to learn music (aside from playing it) than to listen while following along with the sheet music. This is usually the first thing I do when I have to learn a new piece, solo or orchestra. Later this month I am performing Shostakovitch’s 10th Symphony and I can tell you, it’s no basket of fruit. It is very difficult. However, many of the most confusing passages I heard before I got the sheet music became very clear once I listened to it with the music in front of me. When I was a kid learning violin, I listened to the records (those big vinyl discs) of what I was playing. Today, we have YouTube (free) and iTunes (reasonable) to find recordings. 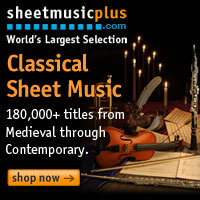 IMSLP usually has recordings of music no longer under copyright. Smartphones and tablets make listening so much easier today. Take advantage of the technology and use it to help you learn. I haven’t flown very much recently, but when I did, I often took that time to learn scores (as a conductor) and whatever violin music I was working on. If you are advanced enough, you can take a new concerto or sonata and put in bowings and fingerings with a pencil. You don’t need your violin for that. Going through a new piece of music this way (without the instrument) is a great way to get a head start on learning it. Be careful though. Sometimes you will find that those cool fingerings you were so proud of when you wrote them in simply don’t work when playing it through. This is normal. You’ll have to edit and work them out in the practice room. Also, bowings might not work when you play it live. Again, bowings can change for the right circumstances so be prepared to change them. In the end, you’ll still keep more than half of what you put in before you ever touched your instrument. I like those odds! This one is for the advanced students, and assumes you have a basic knowledge of conducting. My teacher in music school loved this. When I had trouble with a passage, especially the rhythm, he would have me hum and conduct it. It’s kind of like humming along with a metronome. It helps you find the beats in a measure and figure out complicated rhythm. Recently I performed Three Dance Episodes from On the Town by Leonard Bernstein (see image to the left). This is a very complicated piece rhythmically. I hummed and conducted the @#$@! out of it in order to get it right. As you can imagine, this works best for rhythm, but it also works for phrasing. Musical phrases are like sentences. They have structure and are separated by “puncuation” like breaths and luftpauses. If you can sing a passage and adhere to these phrases, you can definitely play it that way. At least 99% of the time, if you can’t sing it, you can’t play it. As you can see, there are many different things you can do to learn music without practicing it. It is very important that you “know how it goes.” There have been a few times where I’ve learned a piece without listening to it, and then was surprised that it sounded the way it did once I got a recording of it. You don’t want that to happen. Listening is really the most important skill you can learn, both in life and in music. Don’t forget, listening is different than hearing. Listening implies understanding so make sure you are listening to your music and not just hearing it. Also, always make sure you understand the written music as well as how it sounds. Different artists interpret music different ways. One violinist might slow down in a section even though the music doesn’t call for it. Don’t fall into the trap of playing what other people play. Play what’s written, then interpret it how you like. That is what makes you an artist and an elite player.